Can you believe we’re already coming to the end of November? At the beginning of the month I thought time might go way too slowly, and now I’m sitting here wondering where the days went! Before any more time passes, I’ve got a list of three updates that involve the number three–totally by chance! 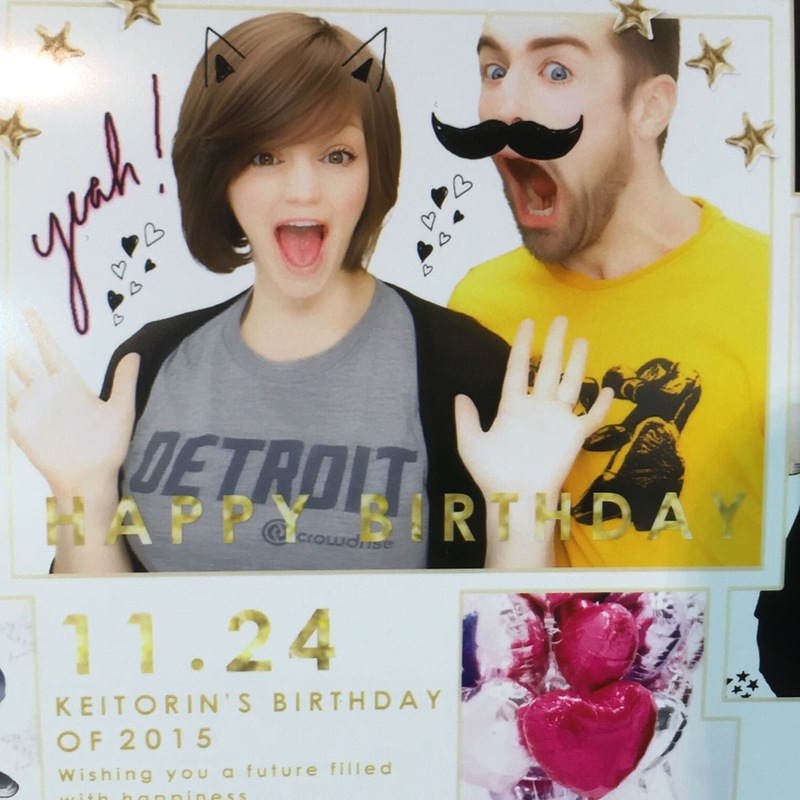 Yesterday was my 30th birthday! 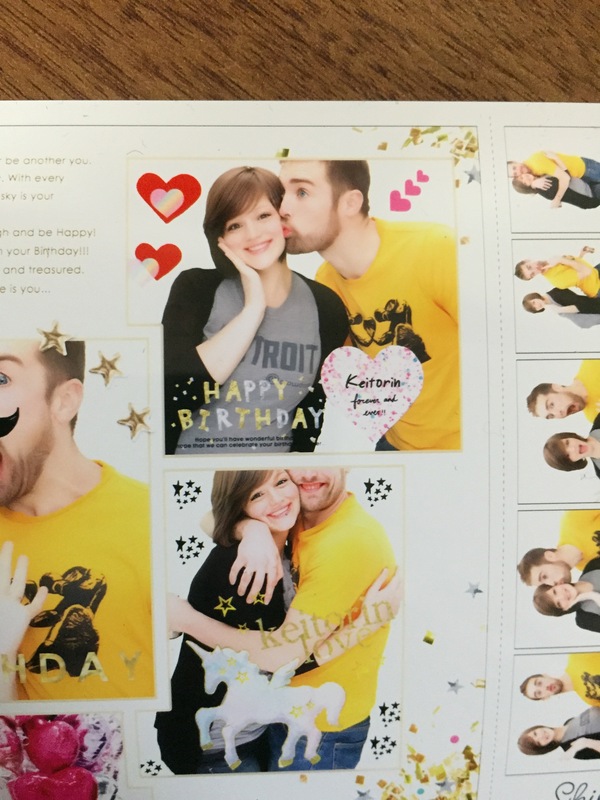 I had to work during the day, but my coworkers gave me a really nice card and a super cute gift. Also, Chad’s students made me a card and sang me Happy Birthday, and my kids gave me lots of birthday hugs and wishes, too. At night Chad and I went for dinner, Japanese photo booth, and a walk before getting cake and heading home. It was a perfect way to spend the evening! Unlike many people, I totally don’t mind that I’ve turned 30–in fact, I am happy to leave my twenties behind and am looking forward to life in my thirties (both my own and that of our sweet baby on the way!). On Monday I began my 31st week of pregnancy. Aside from general exhaustion, occasional heartburn and continued congestion, things are going swimmingly. Baby is healthy, and according to today’s appointment, slightly longer than average Japanese babies (the nurse said we have a “tall, slender girl”). 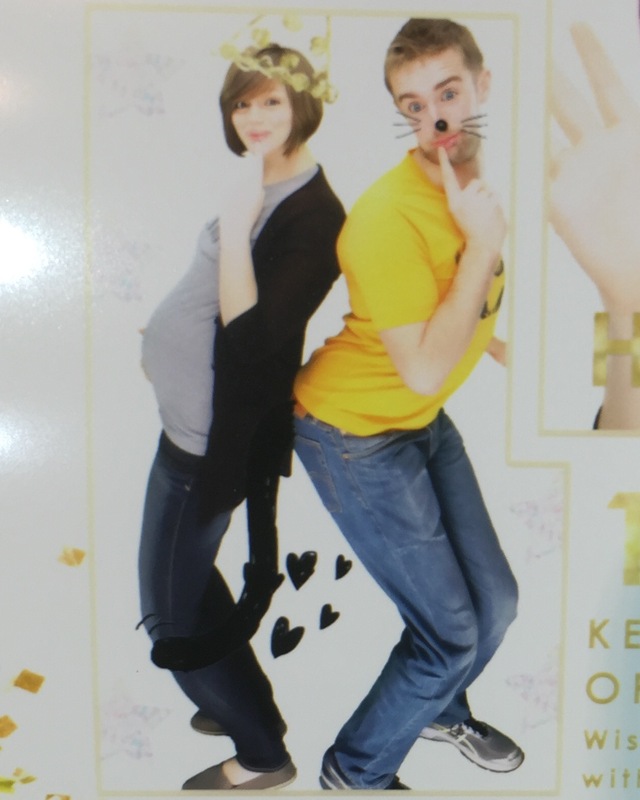 I’d say my bump has grown a bit since our last go at purikura, wouldn’t you?Some interesting things I’ve learned since my last post on pregnancy in Japan: at my hospital, you unfortunately cannot donate cord blood. My hospital also does not take a newborn photo, but since we get a longer hospital stay (in Japanese hospitals mommies get to rest and recover with baby for around 6 days after birth), I think we’ll have a few opportunities to try and take one ourselves! Also, you may be happy to learn that despite my previous concerns, my hospital is not a participant in pre-delivery kanchos (or perhaps it was just me that was happy to learn that…). Lastly, in Japan they give you a little box and cloth bag to put the umbilical cord in after it falls off so you can keep it. Forever. And just in case something happens to the cord, you get a backup section of cord that’s cut off while you’re still at the hospital. I asked, “So do you…ever look at it again?” The nurse just kind of laughed and said maybe… Baby’s due date is two months from today, and I have less than three weeks of work (there’s that number again!) before I’m on maternity leave. 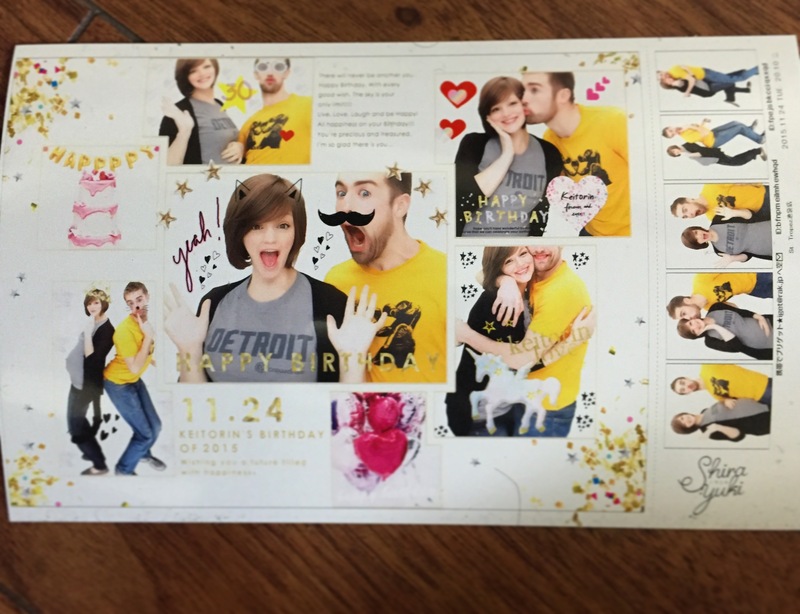 Chad and I are both bummed we can’t be home for the holidays, but we’ve got some things to look forward to that will help ease the homesickness! One thing I’m super exited about was part of my birthday gift from Chad: tickets to see The Nutcracker a few days before Christmas! I am also pleased to say we finally got Ghibli Museum tickets, and that they are for Christmas day! Should be a really fun addition to our other plans for the holiday. Lastly, I am really anticipating all things holiday-related. I’m not a super huge fan of winter, but I still love this season of cozying up inside and finding warmth and light with loved ones despite the cold, gloomy weather. Special gifts, food (even if the food isn’t exactly what we’d have back home) and possible little trips (we’re hoping to go on a trip in the end of December if doctor appointments and other scheduling issues allow) help to keep the season bright. What have been some interesting happenings your way as of late? And what are you looking forward to in the coming month? Take care, and stay warm! Yesterday, as you may have seen on instagram, we decided to hike Mt. Takao. After a long but fun day out of the city, we were very ready to eat when we got back to Tokyo. We decided to revisit a restaurant we tried for the first time a couple of weeks ago called Gotoo. 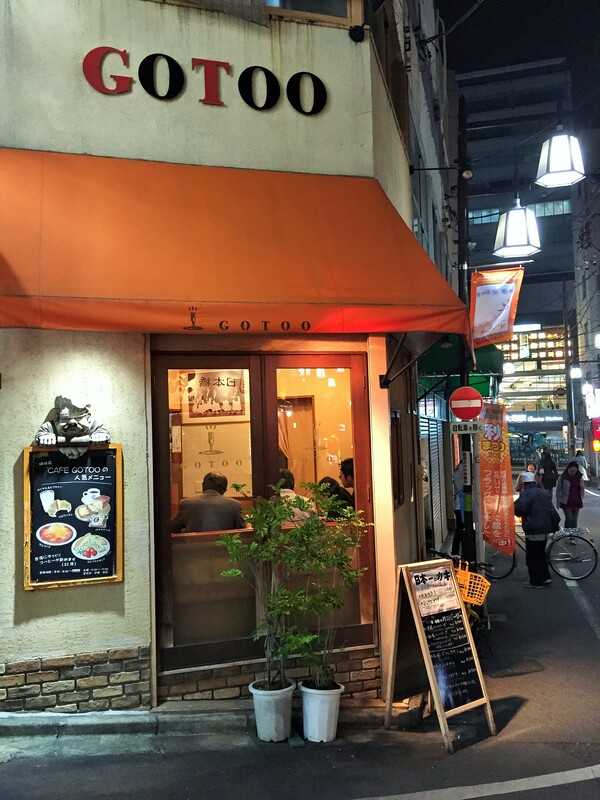 Gotoo is about a two minute walk from Otsuka station, has a review of 4 out of 5 stars on yelp, and always has a line when we walk by. 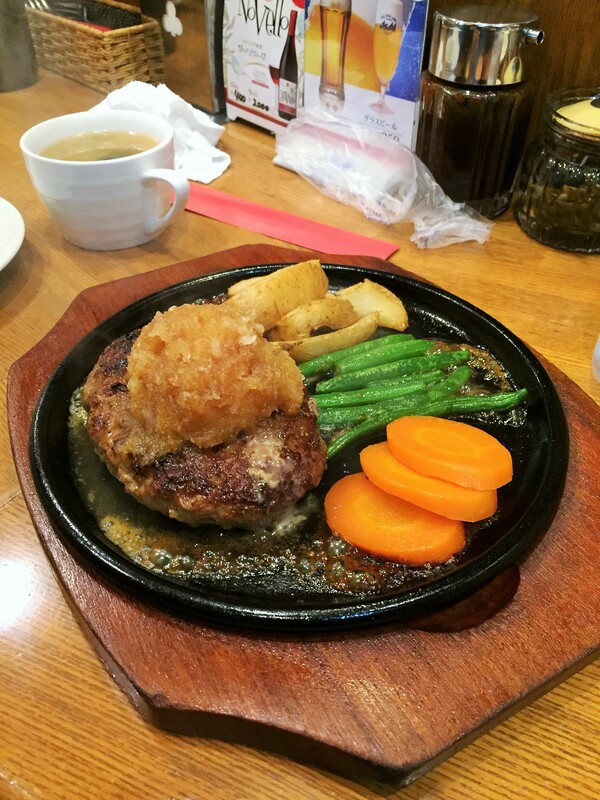 Despite the small size of the restaurant, the wait usually isn’t much longer than 15 minutes, and the friendly staff take your order while you’re waiting so that your meal is ready close to the time you sit down. Yesterday we were seated at the bar, where you can see two to three chefs working away, usually smiling while they’re doing it! 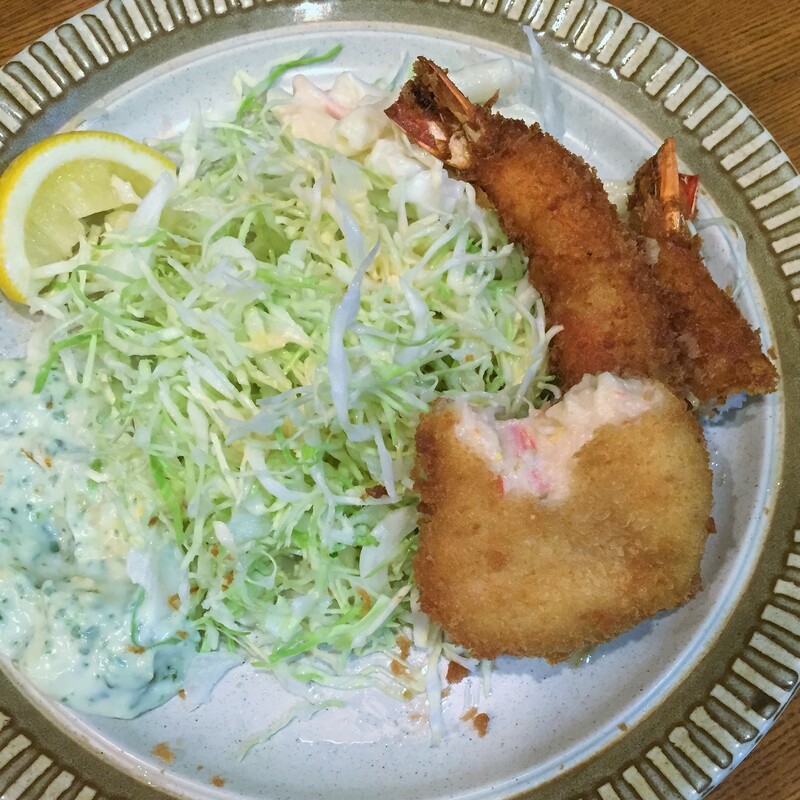 I ordered the same meal I got the last time I went because it was fantastic: the Combination B Set of ebi (shrimp) fries, kani cream korrokke (crab cream croquette), cabbage, noodle salad, rice and miso soup. 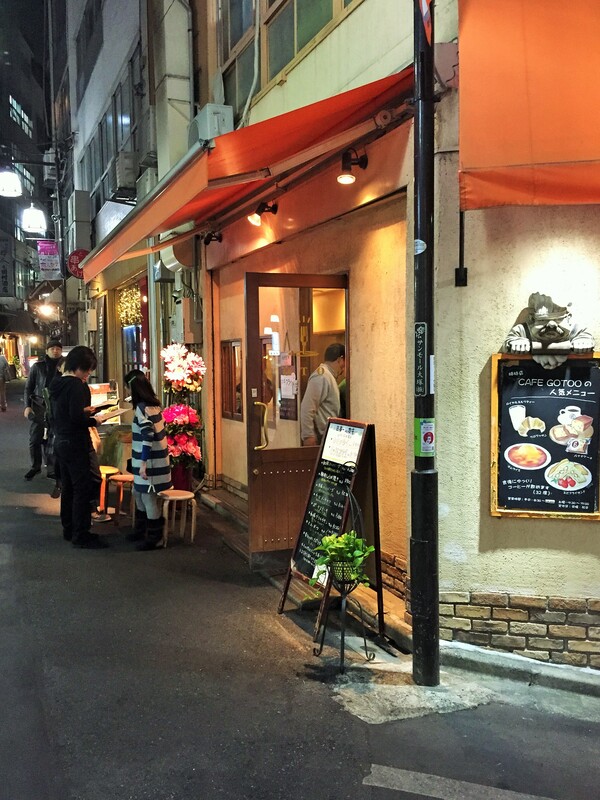 If you’re in the Tokyo area and you’re looking for a new restaurant to try, I would recommend giving Gotoo a try. It can be a little pricey (my meal was 1200 yen), but if you are into ebi fries and croquettes, the money is totally worth it. 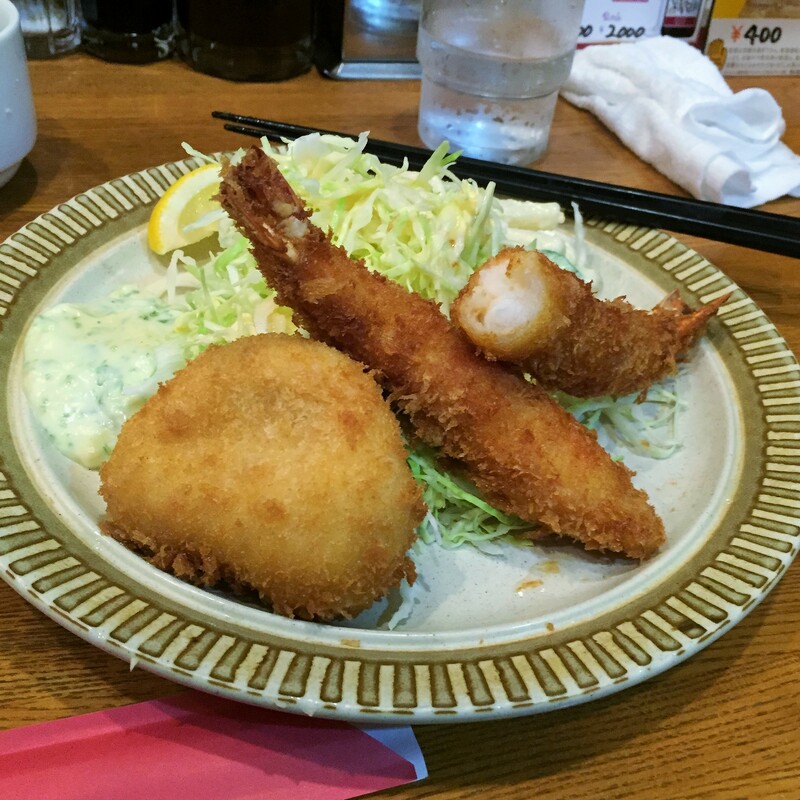 If you’re NOT in the Tokyo area, consider checking out some recipes for croquettes! I never had them before living in Japan and they are one of my favorite foods (on the less healthy spectrum 😉 ).